Do you ever wonder what Chung Fa means? I don’t think that their cook knows it either. 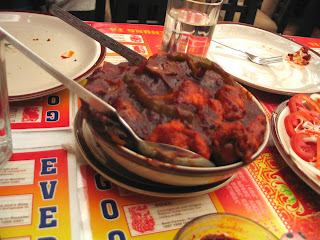 Indian style ‘rasta’ Chinese is served in a small diner called ‘Chung Fa’ on East Street. We have eaten this kind of Chinese food standing on the street at the hawker around the corner. Chung Fa serves the same kind of Chinese food at similar prices, indoors. It is truly what we Indians call ‘Sasta, sundar aur tikau’ that is ‘reasonable and nice’. The sesame chicken and fried mushroom starters were crispy and satiating. The chicken triple Szechwan with rice, noodles, a spicy sauce and chicken pieces was filling and enough to fill two hungry girls, Nirali and my own. I was meeting my high school friends after seven long years. The evening called for a venue that was close to our old school which was in the city centre, affordable and a common preference. Chung fa was perfect. It has all these qualities, rasta Chinese is common preference, Chung fa is reasonably priced and is located in the centre of Pune city. 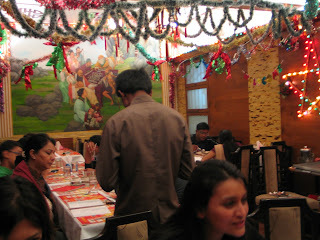 The ambience is a loud, cluttered and noisy. The diner is divided into two small dining sections. The inside section can make you feel a tad claustrophobic considering that the diner is usually full. The best part of this place is that it is great value for money. The server kept forgetting that people need a refill of water. Being located in the city, close to schools and a movie theatre it is more reasonable that many outlets in that area. According to Nirali, Chung Fa has another plus point; it is one of the few outlets that accept ‘Sodexo food coupons’. So, employees of those ‘Sodexo’ generous firms, dig in. That thing about this place is that it serves roadside or ‘rasta’ Chinese, indoors.